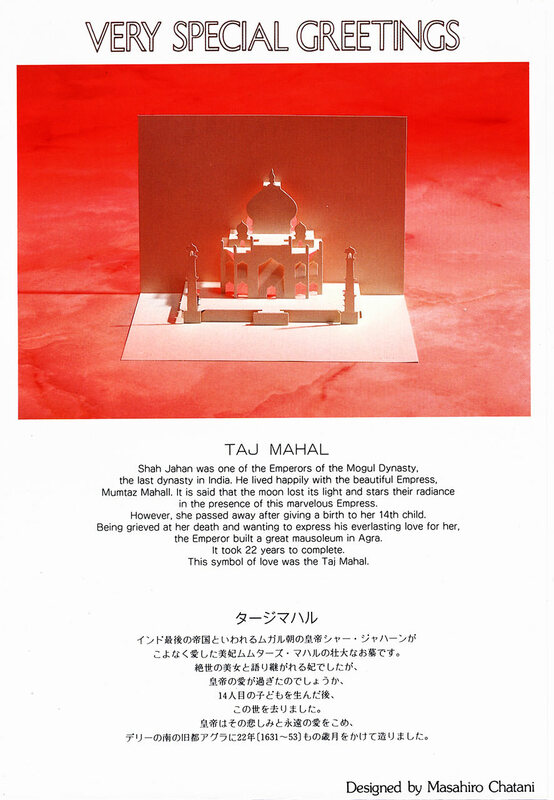 Master origamic architect Masahiro Chatani‘s take on this world-famous landmark makes a perfect pop-up gift card for any occasion. Shah Jahan was one of the Emperors of the Mogul Dynasty, the last dynasty in India. He lived happily with the beautiful Empress, Mumtaz Mahall. It is said that the moon lost its light and the stars their radiance in the presence of this marvelous Empress. However, she passed away after giving birth to her 14th child. Being grieved at her death and wanting to express his everlasting love for her, the Emperor built a great mausoleum in Agra. It took 22 years to complete. This symbol of love was the Taj Mahal. 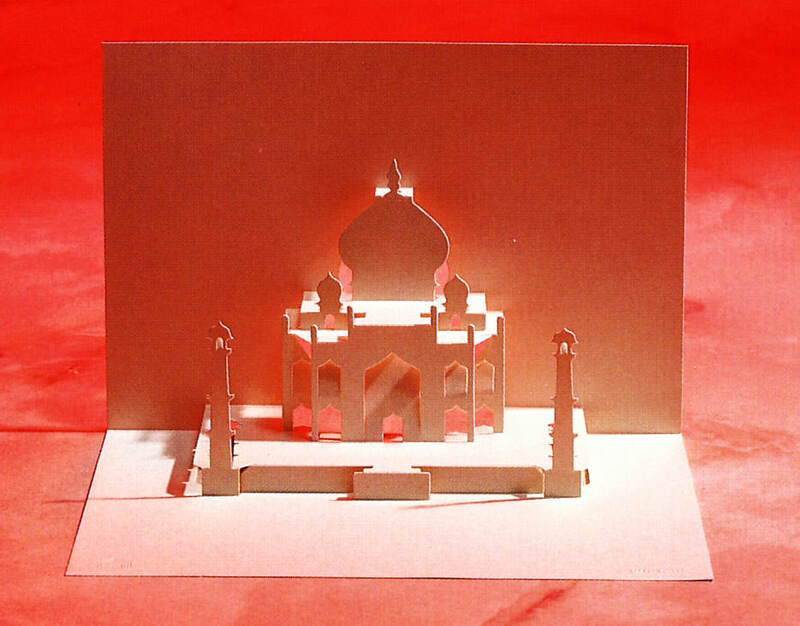 Commercially-produced die-cut origamic architecture pop-up card and envelope. 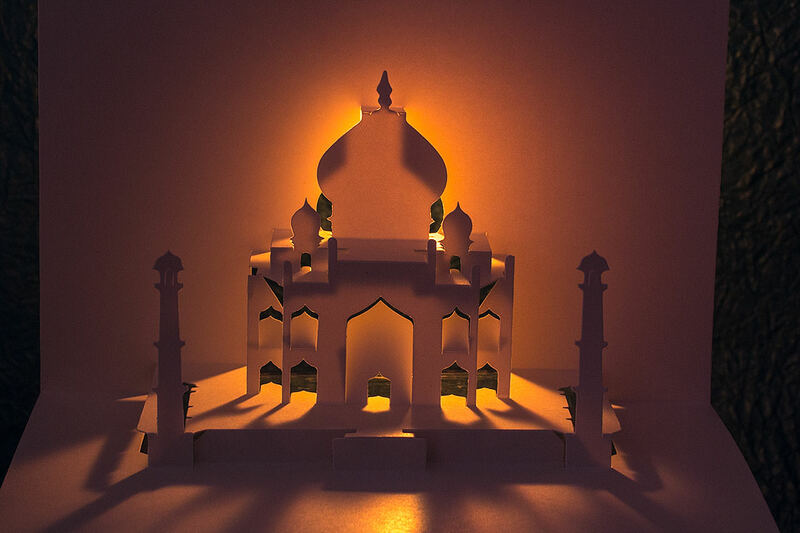 The Taj Mahal Pop-Up Paper Sculpture by Ingrid Siliakus is an intricate, elegant and immediately recognizable take on a landmark known world-wide. One of the first commercially-produced designs from Aya Chatani is a wide-format pop up card representing a Tokyo point-of-pride. This pop up of the instantly-recognizable French landmark delights as notice of your impending Parisian adventure or a gift card for any occasion. A pop up card evocative of exotic Morocco and the Arabian Nights makes a perfect gift card for a birthday or any occasion.